During our workshop, particular dilemmas and nuanced opportunities for the decolonization of knowledge were revealed and they are expounded at length here. It is our hope that this detailed reflection can serve as a rubric of important lessons and examples for readers of ROAPE, who have long demonstrated commitments to radical and critical scholarship of and from the continent and who are likewise immersed in decolonizing projects in their respective spaces and institutions. 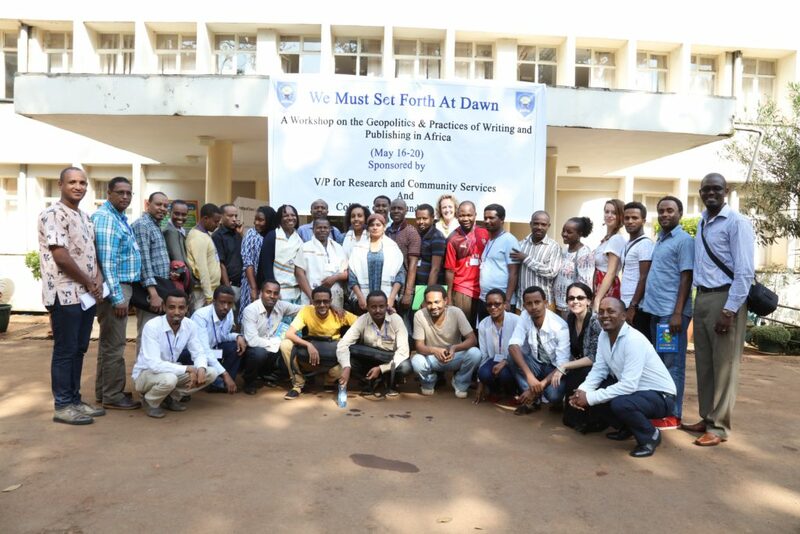 Hosted by Jimma University’s young and enthusiastic College of Law and Governance along with the Vice President’s Office of Research and Community Relations, this 5-day writing workshop brought 36 scholars from nine countries to Jimma, Ethiopia. Our group constituted of seven conveners from Bangladesh, Ethiopia, Egypt, Canada, Somalia, Uganda, Jamaica, the UK, and the US. Our 30 participants joined us from across Ethiopia, Malawi, Tanzania, Nigeria, South Africa, and the UK. More than half of the participants were affiliated with institutions outside of Jimma, including Addis Ababa University, Gondar University, and Wolkite University. All of our participants were faculty at universities on the continent. In one week, we set out with an ambitious agenda. The main objectives of the workshop were threefold: a) to share theories and praxis on decolonizing knowledge production in the global South; b) to generate discussions about the realities that African-based scholars face as they seek to publish their work as well as about the ways in which nonwestern scholars might craft out their own intellectual spaces and research agendas; and c) to offer workshop time for scholars to discuss their works-in-progress, as a way to create transnational community and solidarity and to cultivate practical publication know-how. The workshop opened up fruitful spaces for exchanges on a vast array of topics relevant to unequal opportunities for knowledge production, academic publication, and transnational nonwestern collaboration and action. The workshop came to fruition within a context of mounting critique against and self-awareness of the so-called “university in crisis.” Although the university has probably always been in “crisis” in some form, our present is a multiform and global “crisis” evidenced through the slashing of university budgets (particularly in the humanities) alongside the swelling prominence of STEM (science, technology, economic mathematics), and a focus on social scientific knowledge for corporate and military strategies. We have witnessed the restructuring of our universities to resemble corporate configurations of power at the same time that universities are increasingly using ranking and rating systems to determine faculty value, which has led to the rise of the so-called “publish or perish” model (but which might more aptly be called “publish or stagnate” in contexts like Ethiopia). The rising salary inequalities between faculty and administration and the subcontracting of teaching labor have resulted in rising academic precarities; this, at the same time that students are often paying more for their educations. Mr. Sintayheu Demeke, Dean of The College of Law and Governance at Jimma University, welcomes the workshop participants and conveners to Jimma. In Ethiopia, for example, students attend university with government grants that are then repaid when the state garnishes worker wages, a payment system that can be fiscally challenging for government employees, academic faculty included. These trends highlight the neoliberalization of higher education institutions and are further compounded by a long-existing global history of marginalization and Orientalization of nonwestern voices. Yet, there have been powerful global movements and sustained conversations against institutionalized forms of racism and other discriminations embedded within and perpetrated through the makings and circulations of knowledge. Open access movements call for a democratization of knowledge and information at the same time that research indicates that the Internet has not provided the channel through which knowledge and information is equally available or, more acutely, equally created—what has been termed the “digital divide.” An analysis of 9,500 journals included in the Web of Knowledge Journal Citation Reports (JCR) database reveals a striking global publication gap. The US and the UK publish more indexed journals than the rest of the world combined. Switzerland publishes more than three times the entire African continent. Simultaneously, African people, places, and knowledges constitute the primary data for hundreds of thousands of articles published annually by social scientists. V. Y. Mudimbe (1988) explained, “Africa” is first invented and subsequently colonized as a subject for theory. Despite important counter-movements, a global knowledge hierarchy persists. Africa-based scholars experience manifold forms of exclusion and oppression, from outright linguistic, epistemic, geographic, cultural, and spatial exclusions to psychological and political oppressions. Our workshop was attentive to the issues faced by practitioners who are already, in their own creative and unique ways, combating and countering systemic disadvantages of working within the global South in a global higher education system that is dominated by the North. These issues include limited access to high-speed Internet, exclusion from academic publication databases and other daily issues (such as routine load shedding of power and water). These are quotidian difficulties that most scholars based in the global North do not experience. Our workshop arose within this challenging context, elicited by years of substantive conversations between the conveners about academic inequalities. Drawing upon an important foundation of previous scholarship and efforts, our intentions at the 5-day workshop were to collectively identify and critique epistemic annihilations and appropriations effected by global neo/colonialism as well as local institutional cultures that do not adequately support writing and reading cultures. In her introductory discussion of the impetus for the workshop, Dr. Amber Murrey (Development Studies, Jimma University, Ethiopia) addressed the pitfalls of predatory publishing. Ethiopian institutions, like many across the so-called “Global South,” link faculty salary and promotion to numbers of publications. The rapid growth of departments and institutions (in Ethiopia, the student population has more than tripled in the last fifteen years), a university structure that favors administrative posts over teaching positions and lack of clarity about varying quality and reliability of different publication venues (among other factors) has meant that faculty are increasingly pressured to publish or stagnate, Dr. Amber explained. At the same time the soundness of particular publications venue are not yet effectively assessed by promotional boards across the continent (although important efforts are being made in this direction, including the identification of predatory journals by academic institutions and the circulation of lists of venues to avoid). As a result, faculty too often submit their work to sub-par, non-peer-reviewed predatory journals. Payment for publication in such journals runs anywhere from $100 to $300 USD for one article, often the equivalent of a month’s salary for a university lecturer in Ethiopia. The participants, organizers, and conveners of the workshop gather before JU’s President’s Building. Another participant asked about protocols for retracting articles that have already been published in predatory journals, revealing another downside of this system: Scholars put in enormous time and energy to produce articles that will be summarily dismissed on funding and job applications. Most of them will never be cited and very few will be read. When the scholar realizes that the publication is predatory and the article has been published, it is often too late to have the article retracted and the editor will be unresponsive to appeals to retract. Rather than submit to predatory outlets, the emphasis at the workshop was on identifying strategies for scholars to publish in peer-reviewed academic journals of merit. We do not want our publications to be dismissed outright as non-scholarly or lacking scientific rigor or merit simply because of the publication venue. If we are committed to decolonizing knowledge, we must combat predatory publishers (and predatory conferences). Some strategies for readily identifying predatory journals were highlighted, including: Obvious grammatical errors in the journal, the quality of editorial team, an easy acceptance of submitted article without peer review comments, and requests for payment before an article can be published. Dr. Patricia Daley (Geography and the Environment, University of Oxford) embarked on an exploration of mental decolonization, narrowing in on methodology as a space in need of decolonizing. She spoke of the present dominance of quantitative frameworks, which problematically propose to render social life quantifiable and, in so doing, simplify complex realities: lives become quantifiable, pain becomes quantifiable, and conflict becomes quantifiable. The calculation of suffering implies that there is a numerical threshold up to which pain, conflict, war, disease, etc. might venture but not surpass, often in the pursuit of profit. In such frameworks, knowledge becomes a commodity. In his discussion of the wisdom of African proverbs as a qualitative knowledge creation approach, Dr. Odomaro Mubangizi (Political Philosophy, Capuchin Franciscan Institute of Philosophy and Theology, Addis Ababa) similarly stressed the need to rethink our methodologies. “Little attempt has been made to study African proverbs as a tool in knowledge production,” he asserted. Yet, “African proverbs are a concise expression of African ontology, epistemology, moral, social and political philosophy.” The exclusion of African proverbs from mainstream academia is a clear demonstration of how knowledge production in Africa is still a colonial project. Ms. Safia Aidid (History Department, Harvard University) spoke to such dilemmas from another perspective: Africans educated in the diaspora likewise often learn to replicate mainstream models. During our open discussions, Africa-based scholars echoed these sentiments, stating that in the universities on the continent, western theories, methodologies, and concepts tend to govern the research of African students and faculty. There was some agreement from the participants and the conveners that a follow-up workshop on developing pertinent methodologies for our varying contexts would be fruitful. It was further stressed that we do not need to seek legitimation from mainstream models and conceptual frameworks. Africa-based scholars must continue to boldly embark upon creative models that reflect the realities on the African continent, we reminded ourselves as we worked to identify international scholarly journals and publication venues more encouraging to and accepting of expressions of alternative modes of knowing. Decolonizing knowledge requires multi-pronged efforts: decolonizing publications, decolonizing research and decolonizing curriculums. We focused on the first two and touched upon the third, while maintaining an awareness that much of discussions around the geopolitics of “voice”–whose is heard and how to “give voice” to marginalized communities—continues to take place in the institutions of the North. This was our effort—(building on important discussions occurring across the continent, including in Senegal, Tanzania, Uganda, Nigeria, South Africa)—to move the critical dialogue South. We built upon ongoing energies and momentums to create opportunity for faculty development and scholarship while making concrete efforts to foster interdisciplinary discussion, share research and sustain writing cultures in Ethiopia and on the continent. The workshop brought a diverse group of interdisciplinary scholars to Ethiopia to act as conveners. Our conveners included scholars with vast international experience, most as non-white faculty who spoke of the experiences of minority and marginalized scholars in the white dominated universities and publishing circuits of the North. Dr. Maimuna Islam (English Literature, The College of Idaho, US) spoke about how radical nonwhite voices remain persistently absent in the US higher education and publishing, thus demystifying a commonplace idealized notion of the American academy as diverse. She connected the ongoing decolonial struggle in the Global South to the almost 50-year ethnic studies movement for racial parity in representation in the US. In America, she informed us, 82 percent of book editors and 89 percent of book reviewers are white, while in higher education, 84 percent of full professors are white. “The knowledge production world is a closed circuit in the North,” she affirmed. As scholars, when we work to get our material published, we should be attentive to the ways in western narratives make our absence invisible or appear normal. She argued that despite these silencings, waves of minorities in the US have performed persistent and diligent radical work to carve out spaces for non-white, non-dominant perspectives and narratives. Dr. Maimuna drew upon the 1857 Indian Sepoy Mutiny and the 1915 Singapore Mutiny as examples to argue how in order to counter colonial myth-making, we would need to embrace alternative approaches to research and sources and radical reshaping of disciplines such as history, literary studies, political theory, to better speak to our experiences. Following her discussion, we embarked on an animated inquiry. How could #CadaanStudies move beyond criticism and discussion to more action-oriented approaches? One audience member asked. Ms. Safia spoke about a subsequent conference that she co-organized at Harvard. Her presentation triggered a discussion of work in the US to create critical, radical Black, Latino/a, Asian, LGBTQ, and Women Studies departments. The culmination of the presence of these departments has helped to transform spaces within the American academy, particularly Area Studies. Our sometimes-tense discussion revealed promising avenues for critical perspectives at the same time that it exposed ongoing paternalistic relationships and attitudes from Europe in regards to Africa. Our discussion might have been, in some ways, a microcosm of the larger #CadaanStudies conversation, which likewise revealed the significance of place, identity, and power in global knowledge making and knowledge dominations. Importantly, the workshop was the first occasion in which the #CadaanStudies conversation was publically discussed in the horn of Africa. While we celebrate the occasion as a victory, it simultaneously reinforces the continued need of academic decolonization and the need to continue opening up space on the continent for critical debate and discussion about race, coloniality, power, and knowledge. In another praxis-sharing discussion, Dr. Odomaro discussed an emerging educational collective: the Great Lakes Open University (GLOU). Merging the technological promise of open universities for knowledge democratization with issues of access and quality of education in the region, GLOU is an attempt to address the critical challenge of high cost of higher education in Africa amid massive ongoing brain drain. Building upon preceding and ongoing energies to move beyond “armchair decolonizing”—that is to say, to do more than talk conceptually and theoretically about decolonizing—this experimental workshop was about identifying and discussing concrete steps to create and sustain dynamic and vital writing and reading cultures in the humanities and the social sciences. Our efforts were both individual and collective as we worked through some of the challenges and tedium of the craft of writing (formatting, time management, brainstorming) as well as the difficulties and the obstacles of submitting and publishing (targeting journals, remarking linguistic and technical particularities, identifying publication venues, avoiding predatory publishers). A considerable amount of time was devoted to having open and semi-structured conversations, either in small group or large group format. Each participant was placed with a convener who read one of their articles and provided feedback and suggestions for reflection, revision, and publication. Groups of four to five scholars discussed their work, talked about particular challenges that Ethiopia- and Africa-based scholars face, noted past achievements, and made suggestions for colleagues. In this setting, participants were able to address individual concerns comfortably, candidly, in detail, and at length. Over the course of the week and through the peer editing process, we discovered that the draft-articles relied on standard academic methodology and drew from Western sources—even though our discussions demonstrated the thirst for more regional perspectives and a commitment to foregrounding African voices. This practice made sense: After all, journal editors and peer reviewers of western journals would most likely respond to article submissions with questions about why has the authors not cited leading scholars from Northern institutions. In order to get published in western journals, one has to follow established rules and repertoires set by the global North, and the blind review process (where the reviewers are overwhelmingly from and located in Europe and the US), especially, is exclusionary and exclusive. In the workshop we acknowledged that western journals often privilege those trained in the west; however, there also radical journals with editors who welcome alternate, creative, and audacious expressions and interpretations of our social worlds. Each participant peer reviewed a colleague’s drafted article and received a review from a peer. Most of the participants reported that this was their first time reviewing a peer’s work within a collaborative context (in the past, many had reviewed colleagues’ research reports and applications as part of their faculty roles). As conveners, we suggested that peer review could be a powerful tool for education as well and could be employed in the classroom to encourage students to think about their writing in new and different ways. Time was devoted to freewriting, most often under the direction of Ms. Diana Van Bogaert (Law Department, the American University in Cairo). Ms. Diana led the group in discussions of practical writing and thinking tools, including concept mapping, listing, looping, word play, force field analysis, assumption reversal, and concept matrices. She encouraged us to identify our own writing and thinking styles—How do we generate ideas? How do we view different perspectives? How willing are we to explore different approaches? 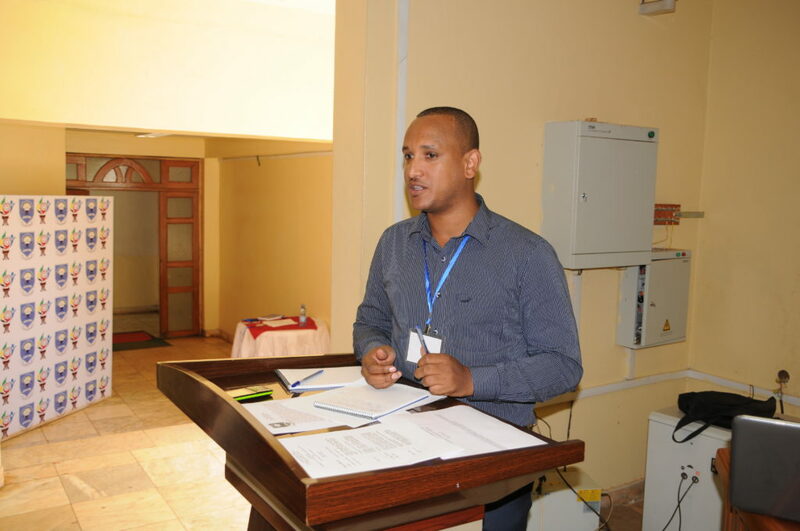 Dr. Tesfaye Gebeyhu (English Department, Jimma University and editor-in-chief of the Ethiopian Journal of Social Sciences and Language Studies) led the group through a peer review activity, in which the nuances and idiosyncrasies of reviewing were demystified and rendered approachable. Receiving peer reviews can be discouraging and hurtful—he shared real examples of hurtful reviews to illustrate the point. Knowing this, Dr. Tesfaye suggested that we take time to reflect upon comments before responding and revising. At the same time, we should work to ensure that our own reviews of our peers’ work are meaningful and constructive. He introduced a technique called “the 3 k’s” that is useful when delivering criticism: “kiss, kick, kiss.” That is to say, criticism (i.e., a “kick”) is best delivered when sandwiched between complements (i.e., “kisses”). Again, our emphasis is that decolonization of the university must be holistic and multiform; we want to co-create writing spaces and cultures in which we recognize each other’s humanity and attachments to our work. As we discussed and considered ways to incorporate, cultivate and encourage writing across disciplines, Dr. Maimuna spoke particularly to faculty burdened with heavy teaching loads about ways to cultivate writing communities through writing pedagogy. As educators (all of the participants of the workshop were faculty at African universities), we were committed to nurturing writers in our classrooms, and Dr. Maimuna recommended that we extend our commitment to our departments and hold informal discussions as faculty-writers about writing processes and struggles, frustrations, and breakthroughs in both teaching writing and our own writing. Dr. Maimuna also encouraged us to “first and foremost, love the inherent beauty of language.” This was important as most of the participants speak English as second, third and fourth languages. She emphasized the importance of “making language ours.” Later, Dr. Patricia Daley reiterated this point, giving the example of the term “glocal” as arising precisely from bi- and multi-lingual scholarship. Dr. Daley encouraged participants to feel comfortable interspersing their own language into their essays written in English for a western publication. Although small, these concrete steps are important to effecting large-scale decolonization. Dr. Patricia spoke about the need to engage in mental decolonization(s) and our concerted efforts to recognize the value of local people and places was a form of practicing precisely one such mental decolonization. While we have framed our engagements as “decolonizing,” our emphasis is not on large-scale decolonization per se, but rather on small-scale, slow, collaborative interventions as we set out to learn together. Such small-scale decolonization has a wide reach—encompassing land, place, food, music, art, history, architecture, thought. We consciously work together to excavate our pasts, to create and recreate our present and to imagine our futures. Finally, in an effort to engage in practical and concrete decolonization(s), we felt that it was important to learn about not only Jimma’s history, culture, and geography, but also how the histories and peoples of the Global South intersect. As such, part of our workshop activities included visits to Abba Jifar Palace and Jimma University’s historical agricultural campus. Dr. Ketebo Shumba, historian and author of a biography of Moti (King) Abba Jifar II, led the group on a tour of the Palace. Biologists at JU showed the expansive agricultural campus, where JU began in 1952. This was a means of offering glimpses of life in Jimma for those scholars joining us from Malawi, Nigeria, Tanzania, or other cities in Ethiopia. These excursions were significant for local, Jimma-based faculty as well, many of whom had never visited these sites and found much to appreciate and discover. In the concluding and reflecting sessions of the workshop, there were enthusiastic calls for subsequent events and collectives to be held and formed in Ethiopia. Participant feedback emphasized a sense of academic isolation at the same time that our commentary reasserted the necessity of critical, radical exchanges in Ethiopia and on the continent, many saying that the workshop was the very first event of its kind that they had participated in. It was a rewarding opportunity, they reflected, but bittersweet. We had an honest conversation about how the workshop came to fruition, in part, due to collaboration with Northerners, who are presumed competent in Ethiopia. How can we ensure that (local) academics from Ethiopia have been endowed with the opportunity to pursue such a workshop independent of external involvement? Our workshop highlighted many commonalities between scholars in Africa and nonwhite scholars in the North and important opportunities for creating transnational and trans-institutional reading and writing communities. At the same time, one participant importantly reminded us of the need to be realistic: While we had ambitiously wanted participants to have submission-ready articles by the conclusion of the workshop (and, indeed, the workshop provided spaces for critical, one-on-one discussions and collaborations; one participant has had his article accepted for publication and we applaud his achievement), most of the participants needed to continue working and reworking their articles. This recognition for the need for time is important for future writing workshops designed for unpublished faculty: Slow scholarship has an important role to play in knowledge decolonization. As with the organization of any academic workshop or event, there were financial and logistical obstacles. In our case, some of these obstacles further reveal inequalities in academic settings. Most recognizably was the difficulty of intra-Africa travel for Africans. Perhaps nothing demonstrates the need for decolonization more than the difficulties that Africans face when traveling to other African countries, while Europeans and North Americans enter easily, often on tourist visas on-arrival. So that while academics in the North decry the perils of “fortress Europe,” structural and economic inequalities extend beyond the geography of Europe, creating exclusions in the South that we continue to address. Our workshop had an obvious gender imbalance, one that is reflective of a larger gender inequality in Ethiopian higher education: nearly 90 percent of the participants were male and 100 percent of the participants from Ethiopia were men, despite significant women-targeted recruiting efforts by the organizing committee (unfortunately two Ethiopian women scholars had to withdraw participation due to scheduling conflicts). As scholars working towards decolonization, we recognize the continued need to create opportunities specifically directed at women faculty. There was a suggestion that, as a way forward, participants keep in touch and continue our conversations, even through informal channels like social media and email listservs, or more formally through widely read and accessible electronic publications (such as Pambazuka News) that could be good starting points for young scholars who were still navigating their path through the highly competitive terrain of international academic publishing. Through our discussions, we determined that very real limitations—including absences of institutional support for writing cultures and lack of access to resources, among others—impede scholars’ ability to research and produce publishable-quality work. An additional dilemma was a gap between spoken and written scholarship: While our participants were familiar with and conversant on topics of decolonization and the needs for alternate and more radical modes of knowing, in practice and in written scholarship these radical perspectives were too often overshadowed by a tendency to replicate limited models of writing and research methods situated around western theories and prerogatives. The recognition of the value of African scholarship and voices was present throughout our discussions, but seemed to get lost in the actual practice of writing. Part of this disconnect is a reflection of the nature of higher education in Africa, where often national ministries of education dictate to universities curricula and pedagogy replicated from European and North American programs. Well-meaning attempts to ensure a quality education have the unfortunate side effect of constricting faculty into imitating rather than innovating disciplines, while also leaving them without the extensive institutional support and resources enjoyed by scholars located in Europe and North America. Another side effect is a constrained understanding of what constitutes authentic, important, or worthwhile research and writing method, and we discovered as a group that alternate modes of communication (including narrative writing) were underrepresented or disregarded all together. Consequently, in the workshop, we encouraged scholars to excavate their own stories and to cultivate new ways of telling their stories (such as through new media or interdisciplinary collaborations) and to redefine and reshape their disciplines anchored within their own histories, traditions, and aspirations—and to also persuade institutional heads to recognize the value of such innovative writing and content. For example, we discussed how the dramatic transformation of the English Department in the US after the 1980s/90s “canon wars” highlighted not only the fluidity and arbitrary nature of disciplines but also how transformation was grounded in the unique intersecting histories of the western world. That is, although there are very real limitations faced by African scholars, the limitations are also surmountable without the need for extensive investment, restructuring, and funds. Because this workshop, conceptually, was not bound by Northern-based scholars coming to “train” people or by a large development group loaning funds and infrastructure, this model is highly replicable. The core agenda was not bound by geography, discipline, or personality. Rather, the agenda was philosophical: We wanted to help to nurture an exploration of decolonization of knowledge through small pivots that would inherently include visionary approaches to and transformations of existing disciplines as well as institutional writing and reading cultures. This centering of the writer as teacher-researcher-citizen in practice in her community is part of what was exciting and thrilling about what we undertook in Jimma. The Jimma University writing workshop was collaboratively organized by: Amber Murrey, Sintayehu Demeke, Bisrat Gebru, Anteneh Tesfahun, Eline Joor, Addisu Tegegne, Tadele Assefa, Isaac Abotebuno, and Kassahun Molla. We would like to give special thanks to Ermyas Admassu for assistance in obtaining visas. Dr. Amber Murrey researches and writes about the transformations of life and place amid colonial violence(s). Her research on oil politics and resistance in Cameroon as well as her collaborative work on the Pan-African legacy of Thomas Sankara is shaped by a decolonial impetus and conviction that scholarship be actively collaborative, attentive, accessible, and decolonized. Dr. Amber obtained her doctorate at the School of Geography and the Environment at the University of Oxford. She teaches courses in qualitative research methodologies, critical development studies, and gender and development at Jimma University and is currently working to coordinate a follow-up decolonizing workshop in Jimma for graduate students. She welcomes ideas and appeals for collaborations via email at ambermurrey@gmail.com. Dr. Maimuna Islam is an associate professor of English at The College of Idaho, where she teaches postcolonial and immigrant literatures, fiction writing, and first year seminar. She has written, presented, and taught on Islamophobia, the war on terror, encounters between the Western and the Muslim worlds, American immigrant experiences post-1967, and minority pedagogy. An intrepid traveler, Dr. Maimuna has visited over twenty different countries throughout Asia, North Africa, and the Middle East. A first-generation Bangladeshi-American with roots in both countries, Dr. Maimuna is currently working on a novel as well as a series of articles on solidarity movements. Dr. Odomaro Mubangizi writes on social ethics and social philosophy in the context of globalization. He is the Editor of The Justice, Peace and Environment Journal and is the founding Editor of Chiedza, Journal of Arrupe College, School of Philosophy and Humanities in Harare. Dr. Odomaro regularly writes for Pambazuka News and teaches Social and Political Philosophy at the Institute of Philosophy and Theology at Addis Ababa. He completed his PhD at Boston College, where he wrote Linking Development and Peace: Towards a Normative Theory of International Relations for the Great Lakes Regions of Africa. Currently, Dr. Odomaro is working on an online distance learning university, Great Lakes Open University (GLOU), as well as a course on Pan-Africanism with Fahamu. See, for example, L. D. Berg, 2012, “Knowledge Enclosure, Accumulation by Dispossession, and the Academic Publishing Industry.” Political Geography 31(5):260–62. See also M. Olssen and M. A. Peters, 2005, “Neoliberalism, Higher Education and the Knowledge Economy: From the Free Market to Knowledge Capitalism.” Journal of Education Policy 20(3): 313–45. See also H. A. Giroux, 2000, “Cultural Politics and the Crisis of the University.” Culture Machine 2, n.p. One need only briefly peruse the pages of The Chronicle of Higher Education, for example, to discern the instability and perpetual fluctuations of academic institutions. See D. Wiley, 2012, “Militarizing Africa and African Studies and the US Africanist Response.” African Studies Review, 24(2):147-161. See also H. Campbell and A. Murrey, 2014, “Culture-Centric Pre-Emptive Counterinsurgency and US Africa Command: Assessing the Role of the US Social Sciences in US Military Engagements in Africa.” Third World Quarterly 35(8):1457-1475. See C. Lorenz, 2014, “On Fixing the Facts. The Rise of Neo-Liberalism, the Metrification of ‘quality’ and the Fall of the Professions.” Moving the Social. Journal of Social History and the History of Social Movements 51(4):5–27. The “publish or perish” (or publish and perish) structure of academic influence and goal setting is manifested differently across space. While much has been written on the increasingly entrepreneurial and precarious nature of academia in North America and Europe, the pervasiveness of predatory publishers and predatory conferences has been given less global attention. See K. Peters and J. Turner, 2014, “Fixed-Term and Temporary: Teaching Fellows, Tactics, and the Negotiation of Contingent Labour in the UK Higher Education System.” Environment and Planning A 46 (10):2317–31. See F. Nyamnjoh, 2004, “A Relevant Education for African Development—Some Epistemological Considerations.” African Development XXIX(1):161-184. See also S. J. Ndlovu-Gatsheni and S. Zondi, 2016, Decolonizing the University, Knowledge Systems and Disciplines. Durham, N.C.: Carolina Academic Press. See F. Nyamnjoh, 2016, #Rhodesmustfall. Nibbling at Resilient Colonialism in South Africa. Bamenda, Cameroon: Langaa RPCID. See M. Ragnedda and G. W. Muschert, 2013, The Digital Divide: The Internet and Social Inequality in International Perspective. London: Routledge. Against a global information hierarchy in which Africans under-produce knowledge online (recall the “global divide”), Dr. Amber suggested an alternate activity: Organizing as a collective to revise and rewrite the Jimma Wikipedia page to reflect and honor our knowledge of the city. M. Graham, 2012, “The Knowledge Based Economy and Digital Divisions of Labor.” In Companion to Development Studies, V. Desai and R. Potter (eds). Hodder. There is an enormously important body of scholarship tracing and condemning this coloniality of knowledge; see various works by Claude Ake, Francis Nyamnjoh, Ngũgĩ wa Thiong’o, V. Y. Mudimbe, Archie Mafeje, Mahmood Mamdani, Patricia McFadden, Sabelo Ndlovu-Gatsheni, Ama Biney, Issa Shivji, Horace Campbell, among others. See E. Sall and I. Oanda, 2016, “Framing Paper on Higher Education Governance and Leadership in Africa.” CODESRIA. We respect the Ethiopian manner of naming here by referring to participants by their title and first names. Jeffrey Beall maintains a comprehensive list of such publication outlets. Those conveners and participants that are faculty of Ethiopian institutions recognize the pervasiveness of a training culture, so much so that our colleagues sometimes wonder aloud at the dilemma of implementation. Often such trainings are designed by external agencies and institutions (although some are conducted collaboratively with extensive consultation with internally-based scholars), regularly attempting to replicate or transplant efforts elsewhere, most often in the US, Canada, and Western Europe. Sometimes this results in patronizing and disappointing exchanges, during which Africa-based scholars feel spoken down to. In our organizing and convening of this event, we remained cognizant of the participants as our colleagues and peers with years of teaching and research experience. We worked to foster mutual learning experiences. JASONTLOW, 2016, “Where Is the Diversity in Publishing? The 2015 Diversity Baseline Survey Results.” The open book: A blog on race, diversity, education, and children’s books. 29 January. Questions that participants raised during this session, included: How do we ensure quality? How do we give room for the traditional face-to-face encounter, as this is essential to pedagogy? How to avoid the neoliberal agenda highjacking such a noble project? While the project is named after the Great Lakes Region of Africa (incompassing Uganda, Kenya, Tanzania, Rwanda, Burundi, and the Democratic Republic of Congo) it is open to all of Africa and beyond thorugh an open, online platform. 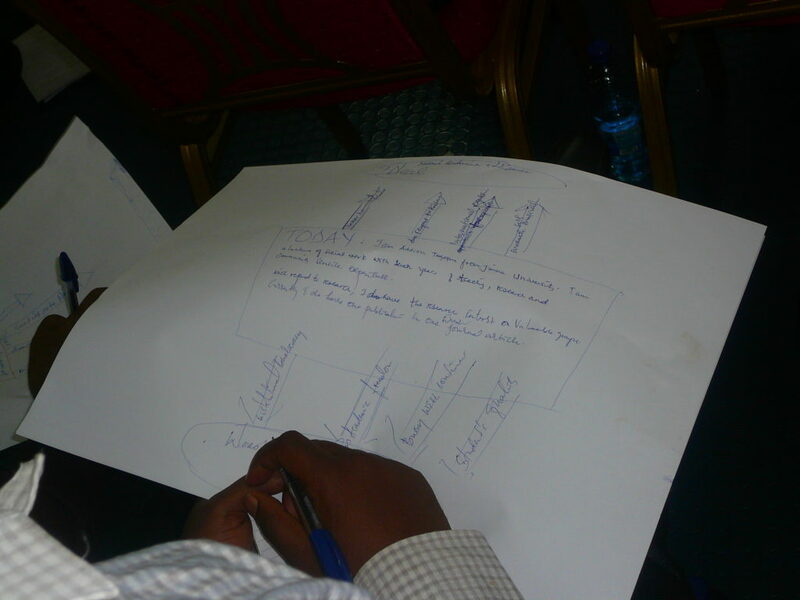 The questions and suggestions from, participants helped to enrich the concept of GLOU. For more information on the project, contact Dr. Odomaro. G. Mohan, 1998, “Radicalism, Relevance & the Future of ROAPE.” Reivew of African Political Economy 78:643-648. In using this term, we are partially drawing inspiration from Presumed Incompetnent, an edited volume that identifies the ways in which minority women of color are presumed to be incompetent in American academia. Our reversal of the term here is meant to highlight entrenched global inequalities in higher education. For discussions of “slow scholarship,” see M. Berg and B. Seeber, 2016, The Slow Professor: Challenging the Culture of Speed in the Academy. Toronto: University of Toronto Press. See also Y. Hartman and S. Darab, 2012, “A Call for Slow Scholarship: A Case Study on the Intensification of Academic Life and Its Implications for Pedagogy.” Review of Education, Pedagogy, and Cultural Studies 34(1–2):49–60. See, for example, A. Murrey, 2014, “Going to the UK? On the Pain, Separation and Dehumanisation of Student Families from ‘High Risk’ Countries.” Politics in Spires: Oxford-Cambridge Blog, n.p.